The State Employment and Unemployment Report released today by the Bureau of Labor Statistics showed that job growth in most states has slowed over the past year. Although the majority of states continued to add jobs, the pace of job growth over the past three months was slower in 35 states and the District of Columbia than over the same period last year. Today’s report also confirms a trend from last month: the labor force in many states is noticeably shrinking. From June to September, 35 states added jobs, with South Carolina (+0.9 percent), West Virginia (+0.9 percent), Arizona (+0.8 percent), California (+0.8 percent), and Wisconsin (+0.8 percent) experiencing the largest gains. Meanwhile, 15 states and the District of Columbia lost jobs, with notable declines in North Dakota (-1.0 percent), Vermont (-0.9 percent), and Alaska (-0.6 percent). For comparison, over these same months last year, 46 states and the District of Columbia added jobs and the average percentage change among states that added jobs was an increase of 0.6 percent, compared with an average of 0.4 percent this year. The unemployment rate fell in 38 states and the District of Columbia from June to September. South Carolina (-0.9 percentage points), Ohio (-0.7 percentage points), Hawaii (-0.6 percentage points), and Virginia (-0.6 percentage points) had the largest declines in unemployment. 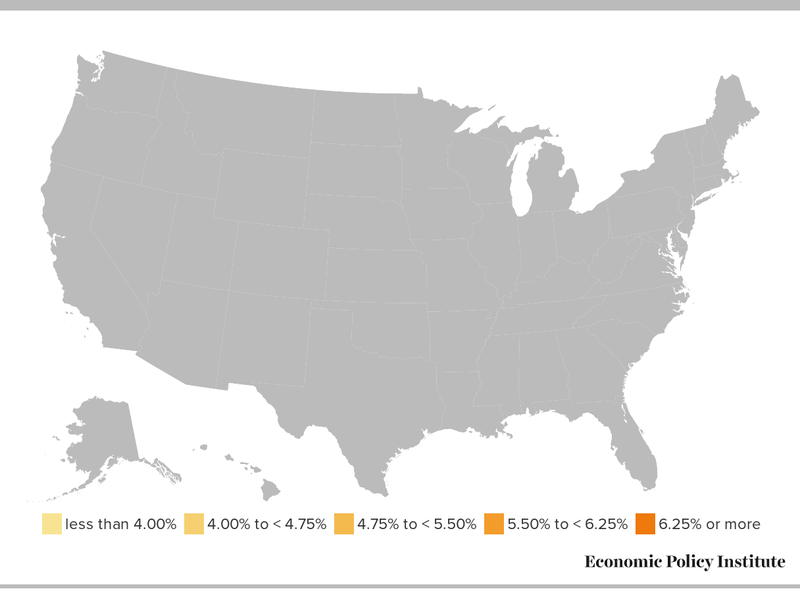 Unemployment rose over the same period in nine states, with Oregon (+0.7 percentage points), New Mexico (+0.4 percentage points), and Nebraska (+0.3 percentage points) showing the largest increases. As of September, the unemployment rate has fallen to where it was at the start of the Great Recession in 23 states, and many others are not far away. However, labor force declines continue to cast a shadow over these improvements. 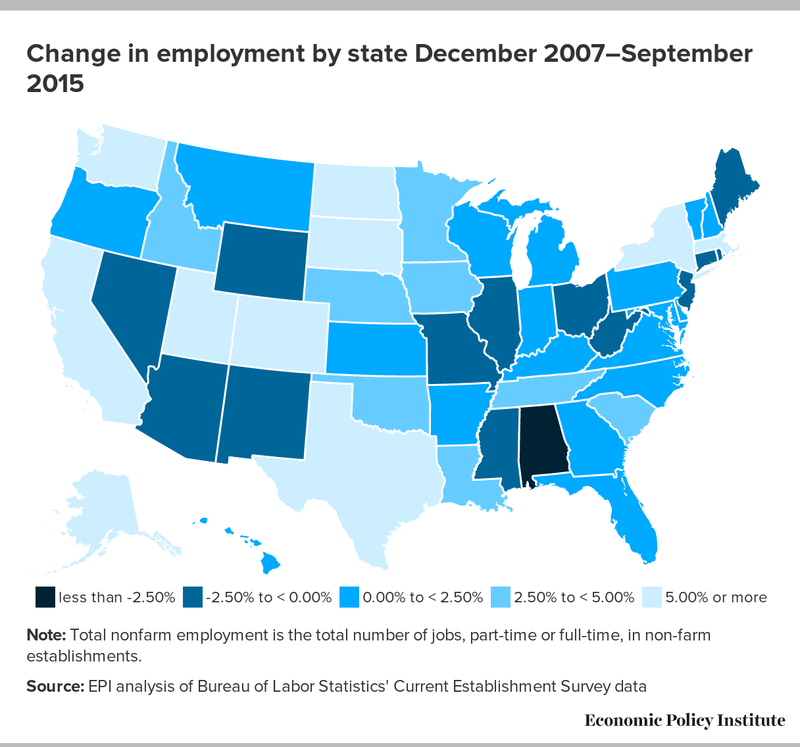 From June to September, the labor force shrank in 40 states—with particularly large declines in Kentucky (-2.5 percent), Louisiana (-2.1 percent), Massachusetts (-1.8 percent), and Tennessee (-1.7 percent)—raising the possibility that some of the improvement in unemployment rates were the result of job seekers giving up the job search, rather than finding work. Indeed, national data show that labor force participation among prime-working-age individuals has declined since the spring. This indicates that weakness in the labor market—and not just the aging of the population—is driving these trends.